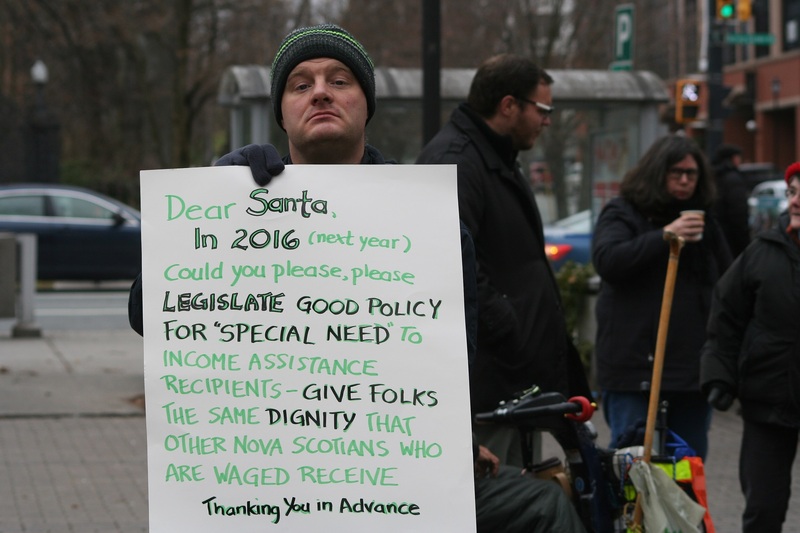 KJIPUKTUK (HALIFAX) – For people on social assistance in Nova Scotia Community Services minister Joanne Bernard is the grinch who stole Christmas. 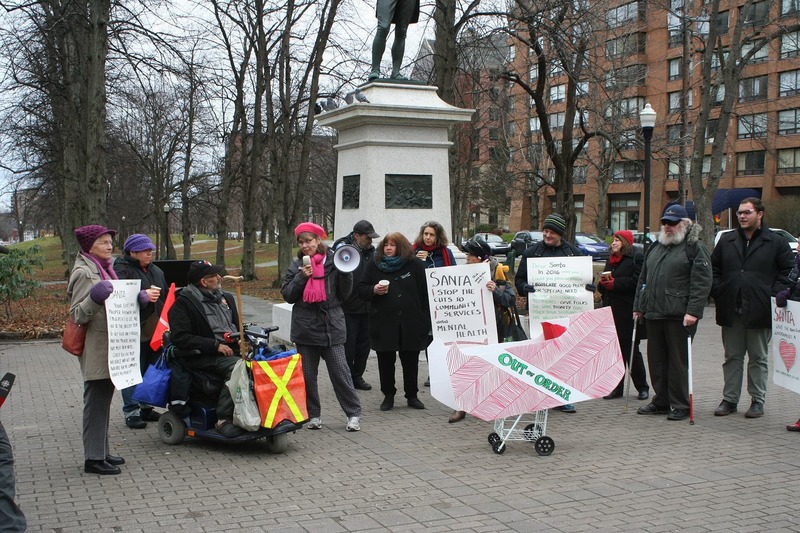 That was the message of a rally at Victoria Park in downtown Halifax on Thursday. The rally, organized by the Community Advocates Network, even brought a sleigh to make its point. No reindeer though, because transportation allowances have been cut back. No way to contact Santa because his telephone allowance is long gone. No presents, because welfare rates have been frozen for two years now, while groceries keep getting more expensive. “We have experienced over two years of frozen income assistance rates, and now we are also seeing people losing special needs allowances that cover necessary things like transportation and telephone,” said poverty activist Wayne MacNaughton..
“I have seen food prices nearly double over the last years, yet the rates are frozen,” MacNaughton said. Poverty activist and frequent Halifax Media Co-op contributor Kendall Worth had this suggestion for the government. “People whose special needs allowance has been taken away should get it back, and the government should reimburse them for the money lost,” Worth said. “People on Income Assistance are supposed to jump through hoops, going from one doctor or dietician to the next. Several people I talked to recently are directed by their caseworker to see a dietician, yet MSI does not cover those visits,” Worth charged. “Doctors are even getting phone calls from caseworkers challenging why people even need special diets,” Worth said. Worth related how a person who lost her special needs allowance now is having suicidal thoughts and keeping herself in isolation. “Give us back those special needs, the sooner the better,” Worth concluded. “We see so many families and children this time of the year who are having their bus pass taken away. People instead get reimbursed for four bus rides a month to get groceries, and that just isn’t enough, said Michelle Towill, a social worker at Adsum for women and children. “A lot of people feel this way, but they are so busy trying to survive each and every day that it is difficult for them to come to a rally. Not to mention the bus fare that they can’t afford,” said Towill. Stella Lord, a researcher and policy analyst associated with the Community Society to End Poverty called on the government to publicly recognize the special needs cutbacks. Judy Deal, who is disabled and depends on social assistance, shared this final thought. Click here for more coverage of Community Services and social assistance issues.